Physical Description: Glass bowl on silverplate base. Exterior of bowl is turquoise with hand-painted decorations, interior is pink. Base is decorated with three cherubs working as blacksmiths to forge arrows. Maker's mark from the Wilcox Silver Plate Company of Meriden, Connecticut on underside. 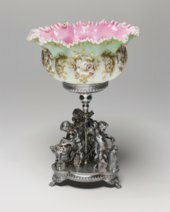 History of Object: Also called an epergne, an ornate glass and silver fruit bowl often served as the center piece of a Victorian dinner table. They were also frequently given as wedding gifts to a new bride. Only basic data is available online for this object. For further assistance, please contact our museum staff.